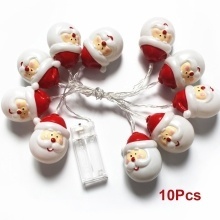 These are lovely Santa Claus decorative lights which can create great wonderful Christmas atmosphere. Hanging them on wall and turn them on, you will see a funny world. Mini and artistic appearance, which is easy to carry. With bright led light, looks very beautiful in the night. Low power consumption is safe and reliable. Can be put or hung on walls, windows, doors, floors, ceilings, grasses, Christmas trees etc.